Instructions in Lightning can be found here. Open the Campaign Tab in Salesforce and click the New button. Important: The fields noted below are required when using the Adaptive Mailer for campaign management. 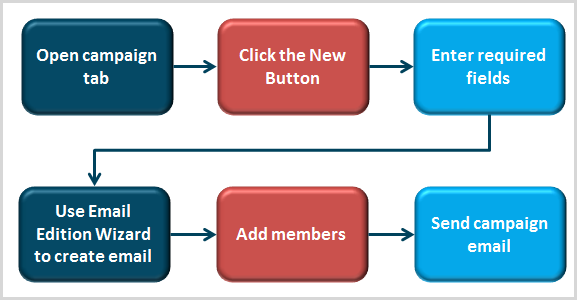 Adaptive: This type will send follow-up emails (automatically) depending on the action each member takes. Click here for more information. Scheduled: Each email is created with a valid date range and will only be sent within that range. Click here for more information. Drip: This type will send each email to the members after the defined number of days. It can also be used for a one-off email blast. Click here for more information. Campaign start and end dates – these dates will control how long your campaign is active and therefore how long emails can be sent from the campaign. Be sure to allow enough time for all emails to be sent. Important: The Active check box is required to activate your campaign and send emails. The box can be checked when you create the campaign or right before you wish to start sending your emails. Reference: Additional options are available for the campaign in the Predictive section on your campaign page, click here for more information.